The Collab Blog: When Conversation Becomes Difficult . . . How do We Facilitate Better Communication? When Conversation Becomes Difficult . . . How do We Facilitate Better Communication? A recap of a Team on Tuesday conversation facilitated by Kim Miklusak. Sometimes controversial topics are embedded in our course curriculum. Sometimes controversial topics come up due to an unforseen comment by a student, or due to issues in the news. Whether planned or unplanned, teachers can find it challenging to facilitate conversation around controversial issues in order to allow for differing viewpoints to be expressed in a way that allows all voices to be heard, and in a way that facilitates understanding and empathy. 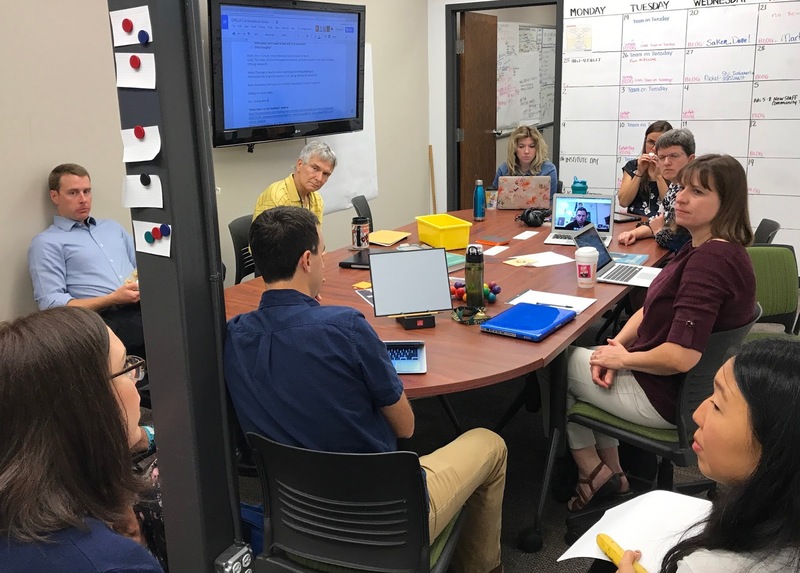 After Kim Miklusak connected with valuable resources to support teachers in facilitating difficult conversations, she wanted to share them with colleagues and create a forum for teachers to exchange resources and strategies of their own. The Collab Lab's Team on Tuesday served as a perfect vehicle to do this. Kim sent an invitation to all staff at EG. Kim also wanted to include colleagues from Rolling Meadows High School, who shared interest in this topic. Google Hangout would make that possible! 15 staff from Elk Grove and Rolling Meadows, from across disciplines (Science, Math, World Language, English and Fine Arts) connected and shared their questions and ideas to facilitate better conversations when controversy can undermine communication. Teachers shared examples of situations they found challenging. They offered specific strategies and resources to respond in ways that foster an atmosphere where differing viewpoints can be expressed and listened to with respect, and questions are asked respectfully to clarify and build understanding and common ground. To get a better ideas of the conversatoin, check out this link to the Google Doc we used to take notes and curate resources. Do you have ideas, resources or questions? We'd love to hear from you! Leave us a comment below!